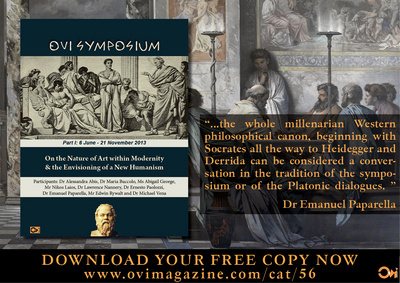 Note to the readers: As of the first of July 2015, the first thirteen meetings of the Ovi Symposium are available as an e-book, and can be downloaded for free in the Ovi Bookshop. HERE! Section 4: A Response by Emanuel Paparella to Abigail George’s Presentation followed by a short initial dialogue on the issue of the alternatives to confessional writing. In this 58th meeting of the Ovi Symposium we follow-up on the last sub-theme regarding truth as the common ground of Faith and Science with a corollary theme: are there viable alternatives to a dehumanized civilization? In other words, once a civilization has gone down the slippery slope of dehumanization, is it possible for it to recover its health or, as Kierkegaard intimated, does complete dehumanization imply the tragic loss of the objective awareness of one’s dehumanization? This is a question which is not an easy one to answer, redolent of Plato’s myth of the cave. How could Plato himself be sure that his analysis of the human condition is correct if the human condition implies the initial almost natural inhabiting of a dark cave full of deceptive shadows and appearances from which one has to escape in order to reach the light of the sun (the realm of the intelligible), and see reality as it really is? Plato himself gives us a rather ambiguous answer: only God knows. The conundrum is briefly explored in the first presentation of this meeting. Indeed, it remains the duty of a rational being to pursue the truth via reason, a duty redolent of Kant’s categorical ethical imperatives based on a universal free will and a good faith, or good intentions. Moreover, in his Critique of Judgment Kant asks whether the aesthetic perception per se is subjective (in the eye of the beholder and apprehended by reason and consciousness), or is it objective having universal and absolute properties independent of human consciousness? In the second presentation Paolozzi treats us to some insightful answers and leads us on an the path of an illuminating excursus of the ongoing history of the journey toward truth which needs to go beyond a narcissistic journey into the Self. Some have called it “the great conversation” across the ages which in our modest way we are attempting to replicate in our Ovi symposium. We continue to converse and dialogue not only among ourselves but also with the great minds and the great philosophical literary works across the ages. More particularly, Paolozzi explores the idea that a synthesis or a dialectical bridge needs to be created between the universal and the particular, the absolute and the relative. This is a Vichian-Crocean operation still not well understood by our over-rationalistic positivistic era enamored of logic and the principle of non-contradiction. Hopefully there will be readers who will lend a ear to the originality of what is being proposed in this meeting which indeed is foundational for an authentic conversation, and therefore for any genuine symposium too. In the third presentation Abigail George presents us with some thoughts expressed in a confessional mode on the subject of dehumanization and human consciousness. The piece, as pointed out by herself, has previously appeared in Modern Diplomacy. Here too the conundrum of subjective consciousness of the Self and the objective universal perception of the realm of the intelligible, comes to the surfaces once more without finding a final resolution. But then again, it is only via dialogue and exchange of ideas, shunning a mere solipsistic mode, that we can even hope to arrive at the essential truth of any issue. Perhaps the journey is the destination, after all. In the fourth section Paparella offers a response to George’s presentation which has already appeared in the comment section of Ovi under one of her articles and which seems appropriate to also append here. It is something that I have been exploring lately and urging others to do likewise; namely that there is an alternate view to the rather subjective confessional therapeutic approach to writing which has to do with the conundrum of what exactly is our Self. It claims to be a more objective way of tapping into what Plato called the world of the intelligible which is basically the human world and human history, or cultural anthropology, if you will. We hope to conduct a fruitful dialogue in this respect in the upcoming symposium meetings; for we believe that a dialogic approach is a sine qua non for any symposium issue. Without a dialogue one may well obtain a brilliant essay with clear and distinct ideas but never a symposium. Last but not least, in the fourth presentation (fifth section) of this meeting Nikos Laios presents to us a comprehensive modern historical view of the nexus between dehumanization and a negative kind of myth making which is usually virulent in extreme intolerant and nefarious ideologies (such as Fascism and Nazism) and proceeds to wreck entire people and civilization. His is almost a prophetic warning to what we in the West may be read to reap after so much wrong-headed sowing. This subject undoubtedly requires discussions and debates. Internal soliloquies are awfully inadequate for that task. Paparella appends a comment under Laios’ presentation regarding the double edged nature of myth. And so our conversation goes on. Philosophy in general would indeed be sterile without listeners and interlocutors. I would encourage the readers who are following us, to give us some feed-back from time to time, or at the very least give us an echo of a conversation, so that we may derive sustenance and encouragement from the hope that somebody is listening out there in the vast space of the intelligible realm, for as Plato well put it, no conversation is possible if there are no listeners. Are there Alternatives to a Dehumanized Civilization? We are now in the 21st century but despite Whitehead’s process philosophy and cosmology, and Sagan’s and Hawking’s scientific cosmological schemes the above mentioned reconciliation has yet to fully appear. To be sure there are some encouraging signs on the horizon. I am thinking here of scientists at the cutting edge of quantum physics already lying the foundations for a new revolutionary cosmology. See The Quantum Self by Danah Zohar (1990) and The Holographic Universe by Michael Talbot (1991). I would like to suggest that the bridge between the extremes of scientism and idealism may well prove to be Vico’s philosophy of history, correctly understood. As we have already intimated, for Vico the historical course of civilizations within a providential order is that “Men first feel necessity, then look for utility, next attend to comfort, still later amuse themselves with pleasure, thence grow dissolute in luxury, and finally go mad and waste their substance” (SN 241). 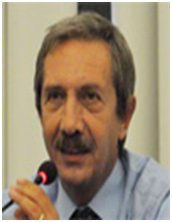 Thereafter, when a society at the last stage of development in its “barbarism of reflection” fails to heal itself by taking responsibility for its history, the Vichian ricorso takes place, i.e., the return to primitivism and barbarism which restores simplicity, religion and poetic wisdom (SN, 1106). It is that ricorso which saves Man by preserving his humanity. Here we need to return to Vico’s concept of Providence, the centerpiece of his speculation. Anselm and Aquinas have taught us that God is the prototype of the thinker in as much as he creates being by thinking it. Vico too, as we have seen, points out that thinking and making are one and the same for God. Therefore, in as much as God has granted his own Logos to both being and the organs of knowledge, “created being” is “thought being” that bears traces of the divine intellect. Vico patterns this convertibility of thinking and making to man’s artifacts and shows that Man is capable of truly knowing only what he himself has made. He will never comprehend fully either nature or its Maker, at least here within time and space. And here lies the root of contemporary Man’s cultural malaise: in the presumptuous conviction that the human mind can and in fact will in the future encompass God’s mind. At that point Man will be a god of sorts. As we have pointed out above, Vico describes thus the last stage of deterioration of a whole civilization: “And finally they go mad.” What brings about the madness is the delusion of being a god which is nothing else but the worshipping of one’s cleverness and its derivations; what the Bible calls idolatry. This is the real original sin: the stubborn refusal to be a creature and the arrogant attempt to become a god. This is the secret wish of Adam surfacing in Hawking who boldly declares that “then we shall know the mind of God.” In other words, then we shall narcissistically worship ourselves as the creators of the eighth day of creation. Surveying ancient history we see a Roman Empire at the summit of its splendor and organizational genius, when unaided human power could go no further, producing a Caligula, perhaps the most representative of the Roman emperors and a civilization on the brink of its own self-destruction gone mad with the worship of its own achievements. Rome becomes a goddess too. Caligula proudly leads the Roman army to the shores of Northern Gaul and commands his generals to collect for him the shells on the beach. A god need not give justifications for his whims. Closer to us, we still have on German soil an American army equipped with all kinds of technologically sophisticated weapons (smart bombs, computer guided tomahawk missiles, stealth bombers, and so on). They are there as part of NATO to protect the Western Europeans (now known as the EU) against a Soviet Union no longer in existence. The Germans on the other hand not too long ago were still paying the salaries of the Russian soldiers still on former East German soil. Nobody envisaged or expected the new threat to the West which arrived on 9/11. This confusion is typical of a civilization which in its technological hubris has perfected the means and neglected the goals. A civilization that by idolatrous self-adoration of its own cleverness ends up discarding the living God. As Carl Sagan puts it at the end of the introduction to Hawking’s A Brief History of Time (1988): “Hawking is attempting, as he explicitly states, to understand the mind of God. And this makes all the more unexpected the conclusion of the effort, at least so far: a universe with no edge in space, no beginning or end in time, and nothing for a Creator to do” (p. x). This is the Cartesian mind-set at work: first God is made the underpinning of one theory of knowledge. Eventually He is discarded as superfluous. For indeed, in our consumer-produced society, having nothing to produce is the equivalent of being superfluous. Once God has been made superfluous, then anything is possible and allowed. As Dostoyevsky points out in his The Brothers Karamozov, if there is no God authority itself loses it legitimacy. Then the world will be governed by Machiavellian “virtù” and “fortuna” with man asserting himself in the world as amoral energy. Inevitably the “will to power” will tend to replace the “will to truth.” The gulags and the lagers become not only thinkable but possible. This is the “sickness unto death,” a “self-forgetfulness” of one’s nature, the final dehumanization of Man. This is the dead-end on which Man is presently embarked in a closed world utterly immanent and deprived of any transcendent principle. When Man in his freedom wills such a world God respects that freedom and simply leaves it alone. He becomes the absent God. As J. Ellul renders it: “The silence of God entails the disappearance of the very meaning of western history. The paradox that is the West exists no longer…The West is dying because it has won over God” (The Betrayal of the West). Those are powerful words. Perhaps more than any other contemporary thinker, Ellul has pointed out that we are the heir of Cartesian world, both in theory and in practice. Such isthe logic behind a dehumanized world emphasizing technological progress at the expense of Man’s humanity. Ellul calls it the world of “efficient ordering” implying the transformation of all the spheres of human activity, be they productive, political, and even psychological, into systems of order arrived at through technology. All spheres of life are ultimately converted into procedures and structures. Humanistic thought rooted in imagination and intuition is simply excluded from this kind of efficient ordering (See J. Ellul’s The Technological Society, 1964). What lies behind this modern phenomenon is the Cartesian scientific mind-set. Way back in the seventeenth century the Cartesian mind-set envisions the machine as a tool to systematically order human experience through a rationalistic division and conversion into procedures of all the processes of the human world. Vico intuited that in that kind of technological world little room is left for works of humanistic imagination (i.e., literature, the arts, history, philosophy, ethics); i.e. the very modes of thought and sentiment through which Man may attempt to understand himself. It is this inability to associate humanistic thought with truth that lies at the root of contemporary technocratic mentality and its sheer inability to provide a unifying vision of the whole of human knowledge. As Gilkey has pointed out, in that kind of world human beings become the servants rather than the masters of the very organizations they have created. The worth of an individual will not be conceived as intrinsic to his humanity any longer but as related to his contribution to an effective, efficient part of a social scheme. Any sort of transcendence over the social system, any inwardness and creativity are not only unappreciated but more often than not they are discouraged. The individual is seen as a mere cog in the system: a producing and consuming machine devoid of any inwardness. Robocop will be seen as a better law enforcement agent than a human being who has fears and emotions and more liable to make a mistake. What is highly ironic is that this cultural disaster and impoverishment has come to pass in the “Christian” West which has always valued, at least in principle, the transcendent dignity of the individual. After all, the inalienable rights enshrined in the US Constitution were not invented by Thomas Jefferson one fine day. They were already intrinsic part of our Judeo-Christian heritage. Christianity has always conceived them as rights that inhere to the reality of the human spirit; what used to be called soul but is today called “software.” One cannot be too far from the truth in asserting that this degeneration of the concept of human spirit is directly related to our civilization’s present state of dehumanization. Indeed, to live by bread alone, for one’s belly, is to have sold one’s soul for a bowl of lentils, and ultimately to die spiritually. “compassionate conservatism” but the sad reality is the sense of being at the threshold of a new Dark Age, when the “barbarians of the intellect” are already inside the citadel of civilization as we know it. Now, if our very cleverness has brought us to this impasse, what hope is there left? I would suggest that in order to recover hope humanity needs to recover its sense of a transcendent power beyond reason (which is not say irrational, far from it) able to temper this built-in evil which seems to be present in what we, who live in an “enlightened” culture, presently consider normal and even good. There is undoubtedly a vast gulf in our present civilization between that for which and toward which man is oriented and the wretched reality in which he finds himself. Dante, as well as the Bible call this gulf sin. This reality can hardly be understood in a society where sin and guilt are either excused as neurosis or exorcised by one’s analyst. Indeed, modern man finds himself at the crossroads. He needs to make a choice between a dangerous delusion of being capable of his own redemption and salvation, that a few more technological wonders will do the trick, or to live in the apathy of a “quiet desperation,” or to muster the courage for a genuine concern for the meaning of his humanity. Only that concern can arrest the process of dehumanization. But in order to make this crucial choice he needs a concept of what it means to be human and how nature, history and humanity are part of a larger spiritual whole. In theological circles this goes by the name of “creation spirituality.” In more traditional and simpler words, Man must know himself. We like to envision Jonathan Edwards and the Calvinists as men obsessed by the concept of original sin but a proper understanding of original sin would make Man conscious of the fact that he cannot justify and redeem himself through technology. But then, how does Man express this unity with nature in the light of the modern post-Kantian consciousness of human freedom and the autonomy of the human conscience? The German theologian Bonhoffer pointed out that modern scientific man has done away even with a working hypothesis of God because he is convinced that everything works just as well without Him. This seems to be modern man’s dilemma, how to avoid, on one hand, the pitfall of subjugation to nature, and on the other hand, that of abusing nature for his own “superior” goals. To overcome this dilemma man must be confident of being capable of transcending nature without destroying it. At this juncture of mankind’s journey the rediscovery of Vico appears to me providential. It may be one of the best alternatives available within Western culture between two extremes: Cartesian technocratic man on one hand, and Nietzschean charismatic man on the other. As we have seen, Vico’s truth while aiming for the transcendent remains at all times open to existence and its contradictions. His historicism may be evolutionary but it is never deterministic as a Fontanelle’s or a Nietzsche’s. Vico insists throughout his speculation that the historian must not anticipate but rather interpret reality. He must always begin with the certum in order to understand the verum. After Croce’s discovery and popularization of Vico in Italy in the 20th century, modern scholars began to understand, although confusedly at first, that (1) Vico is indeed very modern in his insistence on a pragmatic approach to thinking; in his insight that thought must be incarnate in life and experience and specifically the nature of history, (2) a mode of thinking that jettisons outright from the flux of reality the pole of the particular and concrete with its inherent contradictions, is a mere game of intellect and cannot possibly constitute thinking, (3) Vico’s merit is that of salvaging the particular from an abstract rationalism without falling into the trap, very common among positivists, of a purely materialistic dimension of reality, (4) Vico’s “ideal eternal history” is not idealistic; it is rather the conclusion of a long speculative process beginning with experience and the particular and always returning to origins; a far cry from Descartes’ scientism setting up the deductive demonstrations of geometry as the only criteria of certitude and reducing philosophical speculation to mere calculation, and the whole of experience to the observation of mere physical materialistic phenomena. As an antidote for rampant Cartesian rationalism, Vico, way back in 1725, proposed his New Science. He correctly perceived that the whole of reality operates on two paradoxically related and complementary poles; for example, particular/universal, form/content, transcendence/immanence, free will/providence, barbarism/civilization, objective/subjective, passion/virtue, intuition/reason, spontaneity/reflection, matter/spirit, body/soul, poetic wisdom/reflective wisdom, tradition/progress, life/thought, and so on. This complementarity issues forth not from a rationalistic pseudo-unity of intellectual categories but rather from an organic unity derived from the phenomenon of its very origins. Unfortunately Vico was not accorded an attentive hearing in the 18th century. In philosophy text book he is usually relegated to a footnote if even mentioned. Even in today’s courses on myth, language and history, academics at best accord Vico a passing nod or a tip of the hat. In his autobiography Vico mentions that his own colleagues would cross the street so they would not have to acknowledge and/or discuss the publication of his book. Indeed, academics are a strange lot. Paul Ricoeur, who has offered us some brilliant insights into the relationship between history and language, in his Time and Narrative (University of Chicago Press, 1985) dedicates the whole of chapter 10 to the hermeneutics of historical consciousness but does not bother to as much as to mention its progenitor. Vico is found in a footnote (n. 33, p. 310), in passing, within the context of Hayden White’s Tropics of Discourse, and Kenneth Burke’s Grammar of Motives. Moreover, a brilliant philosopher of science such as E.A. Burtt, already mentioned above, former professor of philosophy at the University of Chicago and Cornell University, investigates in depth the scientific thinking of Copernicus, Galileo and Newton in his classical The Metaphysical Foundations of Modern Science (1924), points out the fallacies of modern scientific thinking, repeatedly mentions precursors from the Italian Renaissance who greatly influenced the development of scientific thinking (Tartaglia), Bruno, Campanella, Leonardo, Ficinus, Nicholas of Cusa, Patrizzi, Torricelli), and utterly ignores Vico’s New Science. Indeed, academics have never been overly kind to Vico’s scholarly fortunes. Various reasons have been proffered for this sad neglect, among which the fact that Vico was not a systematic thinker and could not therefore be easily pigeonholed. This intriguing phenomenon of Vico’s neglect in academic circles, which begins when he was still teaching at the University of Naples (where he never rose beyond the rank of Assistant Professor), and continues even today remains to be examined and studied carefully. I propose it as a challenging project for the Metanexus Institute and The Global Spiral. Be that as it may, the cultural malaise took its tragic course in the 18th and 19th century till Nietzsche proposes the abandonment of rationalism on rational grounds, pronounces God dead and the Enlightenment dead with Him, and in order to revitalize a sick civilization proposes the creation of immanent values as discoverable at the very core of human nature. Nietzsche correctly perceives that these values spring from a primordial religious impulse in Man. The cultural disaster seems to occur when the pole of transcendence is abandoned and the will to power replaces the classical Platonic Aristotelian will to truth. Nowhere is this more apparent than in modern academia where truth is piously professed but power is cavalierly practiced. The disaster need not have occurred had Vico’s alternative been given a more serious and attentive consideration. Today Vico is much better known than in his own century, however, he continues to be subsumed under idealism or romanticism and even under the Nietzschean rediscovery of the sacred. That is a mistake and a disservice to Vico’s thought. Vico’s signal contribution and importance, to my mind, consists in the fact that he is still today the most valid alternative between Cartesian rationalism ushering in technocratic man ready to efficiently order the world, and Nietzschean anti-rationalism ushering in charismatic overman devoid of transcendence and ready to transvaluate values and impose them on a world locked in a deterministic eternal return. The final question then is this: Will our over-rationalistic culture finally opt to change its current paradigm of reality and recover humanistic imaginative poetic modes of thinking as exemplified by the poetic philosophy of Vico? At this juncture of our historical journey our very humanity may be at the crossroads and Vico may be the guide we desperately need in order to choose wisely and continue the journey to its final destination. Dante needed a wise guide to begin his arduous imaginative inner journey to salvation. Can we afford to do any less? (What follows are extended excerpts from an essay read at the Edgar Morin Convention held in Messina from the 24th to the 26th of July, 2006 on the theme of “Chaos and Complexity” and then published in its entirety in the journal Libro Aperto, n. 47, October-December 2006). There are no absolute principles, except the principle of liberty which by its own nature does not admit any absolutes. It cannot be denied that humanity pursues the discovery of an absolute principle, which would reduce life’s tragic events to a unique positive solution; that is obvious. It wouldn’t be worth talking about it were it not for the fact that in the name of absolute principles absurd crimes have been committed enough to eclipse any hope for the future of humankind. On the other hand, it is equally trivial to sustain the opposite thesis that there are no principles. All one needs to do is look at daily life to be aware that it moulds itself in an infinite phenomenology of events. This observation too would not merit further deepening were it not for the fact that it too has produced tragedies and extraordinary suffering. It is therefore the duty of philosophy to search for another road which would point to a path wherein the absolutist or reductionist necessity and the pluralistic or relativistic meet in a synthesis which takes into account both positions. This can happen through a retrieval of the most modern and intelligent dialectical historicist thought. This important issue that may appear to some too connected to pure theory, too metaphysical or, at the very least too philosophical, suddenly becomes urgent, pragmatic, all too pragmatic, if it is immersed in historical political reality. If one tests this, even if rapidly and a bit superficially, by retracing the history of the most notorious political theories, comparing them with concrete political events, we will immediately become aware that the absolutist position, which we also call reductionist, has ended up in totalitarian or libertine practices. Before proceeding a metedological caveat is in order: it is not legitimate to assert a mechanistic relationship, of pure casuality, between political doctrines and etico-political events. Were we to do so, we’d fall back in the very mistake that we are fighting against. We’d be reducing the multiplicity of those events to a single cause. For example, we can well understand the political intentions of Popper who in his famous book The Open Society and its Enemies, condemns Plato, Hegel and Marx as ideal responsible people of totalitarianism. But nothing compels us to maintain that those authors are directly responsible, the causes of the choices that other men, whether or not inspired by them, have concretely made. Those are responsible for their own actions, which they could have chosen not to do, despite the possible influence of a cultural climate, or the spirit of the era, or political convictions more or less radical. If we had to interpret the three above mentioned philosophers with the needed necessary intelligence and intellectual honesty, especially if we locate them within their historical period, we would soon find out many motives for understanding their reasons, if not for absolving them. The Platonic idea of the construction of a well ordered perfect state (an idea nevertheless mitigate in the last Platonic dialogue The Laws) corresponds to a necessity that is not only psychological but also political and ethical within the time of crisis in which he lived, and fits within a general philosophical problematic: the search for truth, around which to organize social life. This is true for Hegel who attempts to find a unifying element within his dialectical process around which to construct his new vision of history. It is true for Marx, who attempts to construct a society devoid of injustice, oppression within which social classes in perpetual struggle will find a pacific resolution. Indeed among all the theories hinted at, we need to focus on Marxism, since it is the one that more than the others has influenced in our times the praxis of the political discourse, giving rise to evident polemical debates. The condemnation of Marxism as an intrinsically totalitarian doctrine has been proclaimed from many quarters and with widely differing argumentations. And here, for the sake of our discourse, I’d like to focus briefly on Popper’s reflection as well as those of Croce in the historicist realm. Albeit the two philosophers did not understand each other regarding the use of the term “historicism,” they both condemned what goes by the term “philosophy of history” which in many ways characterized Marx’s thought. That is to say, the idea that the entire historical journey can be read and explained can be read on the basis of a few explicatory principles of an univocal nature. In other words, the attempt to reduce the entire phenomenology of life, its cultural, psychological, politician, even ethical aspects, to a specific law, that of the economy understood as a class struggle for the conquest of the means of production. Even the historicist and Hegelian Marx, anti-Enlightenment and anti-scientism as he was, pertains to this mechanistic category, which today we call reductionism or determinism which is quite typical of Newtonian science. Of course we cannot forget that both Popper and Croce appreciated many other aspects of Marxism and the Italian philosopher goes as far as proposing a methodological revision by redefining historical materialism, the kind of interpretation which underlines the purely economic aspects of history; a canon of interpretation that he considers very useful at times. But it is a canon, not the absolute canon. That having been said, having paid our dues to history and hermeneutics, based on the same principle of hermeneutics, we need to declare our position. There is no doubt that the interpretation of those theories, which Croce would dub etico-political would lead us to retain that the attempt to reduce the debate and the political struggle to one principle, be it that of the strengthening of the State, or that of the realization of communism, has at its core the totalitarian vice. Life’s complexity cannot be reduced to one overriding principle, since by doing so one annihilates complexity, and with it liberty itself. Liberty is in fact both the condition and the effect of complexity. It is therefore necessary to return to a confrontation with political theory introducing in the discourse the new sensibilities of contemporary research, or rediscover philosophical methods for too long reduced to pure formulas. Although we have not yet won the battle of the diffusion of a new sociology of complexity which refers to the vast work of Edgar Morin in our cultural institutions, even if the new suggestion of modern epistemology and the redefinition of historicism have not yet substituted the old mind-set in our academies and in the traditional centers of research, there is no doubt that progressive steps have been taken, at least at the level of the cultural elite, the wall of conservatism has been breached. What is needed now is to extend it to the world of praxis, of politics where the liberal method has attained considerable successes, even if it continues to be the prerogative of a minority. A substitution is needed, to the anxiety of the search for simplicity we need to substitute the taste for complexity, for liberty, as Alexis de Tocqueville would have put it. In the case of liberalism the matter becomes more complicated, From it very inception as a political doctrine at the dawn of the modern era (not to be confuse with the history of liberty which originates with the birth of humankind), liberalism is naturally characterized as a doctrine of openness, of welcoming of diversity, of tolerance, as the classical essay by Locke, the symbol of modern liberalism, reminds us. There is no doubt that on the level of the historical and the concrete political action, liberalism and liberal democracy, in the 17th, 18th and 19th century have furnished us, in their varied forms and representations, an inimitable example of resistance to every form of totalitarianism and political reductionism, if we may so define it. There is no doubt that it opposed the privileges of the ancient regime, or that it saw itself as a constitution of Liberty, or furnished the instruments for the advent and the spreading of democracy as exemplified by the French and the American revolutions, or that it supported the fight for the liberation of peoples and nations from foreign imperialism, as in the Italian Risorgimento or Romanticism. Liberalism has always been defined as a doctrine which is revolutionary and governing, always tending to establishing a new order, a new political and social constitution. Let’s be clear about something, we are not denying that the purpose of every social doctrine should be that of organizing society, for to deny that would be to fall into a sort of romantic and literary anarchism which is not practicable on the ground of a concrete social life. But we ought not to forget that liberalism, throughout its history, in order to realize its etico-political ends has often had to present itself as a closed doctrine, and therefore under certain aspects, commit an act of reductionism or rationalism; and this not only because at its birth it was founded on empiricist and rationalistic philosophies, but above all because, to be able to oppose the myths on which totalitarian regimes rested, was forced to construct a theory which was just as strong and symbolically representative: we are referring essentially to the so called giusnaturalism, or natural right theory. It was a revolutionary and fashionable idea of the times, already anticipated in Greek Stoicism and Christian jusnaturalism, namely that the rights of liberty and justice are natural rights, and therefore eternal and inviolable. This conception of life, whose revolutionary value we cannot stress enough, had in its bosom a static element which was in some way deterministic or reductionistic, even metaphysical. Which were those natural rights, and why were they natural and why were they inviolable, cannot be explained in the abstract. In reality those rights which were declared eternal were proclaimed in a particular historical era and were rejected by oppressive or odious social groups. Is it still possible to construct liberalism on a simple idea of the world after those theories have been subjected to a rigorous test not only by philosophical critique but by history itself? How often, in the name of those rights which are considered eternal injustices have been perpetrated, and how often has liberty been repressed in the name of liberalism? We do not to answer those questions, since the answers are in the open for everyone to see; for anyone who wished to pay some attention to the themes of bio-ethics. They would immediately discover that the right to have rights, which seems to be the most inviolable and more “eternal” than the others, that is to say, the right to life, is not so obvious as one would think. All one needs to do is refer to the classical case of the potential contrast between the right to life of a newborn with that of the mother, to became aware that the instrument of logic or logical positivism, be it analytical or reductionist does not prevent one from falling in unsolvable contradictions. When one reads some sophisticated moral conundrums one gets the impression that we are playing a game with the life and the death of real people within a useless philosophical excursus. There is a last but essential aspect of this issue, the so called liberal individualism. As is well known, liberalism is considered a doctrine which puts at the very center of its conception of life the idea that the individual represents the very core of history, the last criteria with which to judge all human activities. What should we understand by individual? And here I am not thinking only of the quintessentially philosophical question of the definition of the individual, from Aristotle to Leibniz and Croce. A relevant question this which in various aspects precedes all the others. I am essentially thinking of the question of the individual from the ethico-political point of view, that is to say, I am thinking of the social function as well as the existential function which accrues to the human person as it develops and affirms itself. Therefore, even in this case, the risk of modern liberalism is that of closing itself within a reductionist position, or it is generally said an economic position. If the defense of the individual becomes the defense of an egotistic individual, if we apply a sort of social Darwinism or, at the other extreme, a sort of social Nietzschenism by which the explication of individual creativity becomes the victory of the stronger, of the individual scientifically selected, or of the superman and the only judge of his will to power, then we’d be outside any ethics of responsibility. The individual is not a monad but rather it is a “political animal.” It is its relationships and has real existence only in its relations which is to say in its history, or more simply put, in his life. From a political-ethical standpoint, the individual can only be thought in its complexity and its infinite possibility. A liberalism that wishes to protect and guarantee individualism cannot do without those considerations and must adapt to the idea that there is no final solution that forever protects the individual, only and always real conditions among which one must choose among various possibilities in the field. This position may be accused of moral relativism (founded on philosophical skepticism) but one can answer that what guarantees the universality of this position is the same position, that is to say, the etico-political horizon within which the defense of individuality is inserted as a defense of moral liberty and not a liberty that is purely existential, vitalistic or economic. Politico-logical constitutions, or as today’s expression goes, of social engineering, ought not be considered useless. To the contrary, the issue is not to hold on to those constitutions as absolute and eternal truths, objectively pure. Even when they present themselves in the abstract form of logical reasoning (or juridical, or constitutional, etc. ), they come into history to resolve particular problems of a particular historical moment; they operate on history thus creating new social life-styles which are not reachable by purely abstract interpretations. Here it may be useful to remember Aristotle’s prospective in his Nicomachean Ethics against Plato’s Republic. A modern theory of liberty needs to be founded on phronesis, that is to say, on the ability to judge. As per the Aristotelian position the ability to judge is born withing a context, and is motivated by the praxis, by the real needs of humankind which aims at seeing clearly in order to act correctly. We must add to this logico-philosophical observation moral action and philosophical judgment (historic and complex) which have their being within a possible utopia, of a regulative idea a la Kant, which is the idea of moral freedom as an essential moment of man’s life, and then the harmonization with liberalism is complete. This kind of philosophical attitude, which eventually becomes concrete political praxis, was partially accepted and developed by Benedetto Croce who defined his liberalism as metapolitical, and his whole philosophy as a philosophy of liberty. Not for nothing Girolamo Cotroneo has defined this position as “anomalous” vis a vis classical Anglo-Saxon liberalism. But in my opinion, this anomaly is coherent with the whole philosophical position of Croce who in fact defined it as methodology of historicity. From this springs the idea that modern liberalism can be defined methodologically, thus depriving any metaphysical residue in Crocean thought as it interprets and modifies the historicist dialectic of Hegel. But however those interpretations may be, what counts is the attempt to propose a new idea of liberalism which does not reject its past, which does not reject the idea that life has to be regulated by a universal principle, while at the same time understands that universality is never abstract, outside of history, but always appears within the concrete phenomenology of life. As an old German philosopher used to quip: “God is always in the details.” This open methodological conception of liberalism allows to leave open the dialogue with other philosophical political positions, to be able to keep its identity in relation to and in the mixing with other cultures with their different sensibilities. Enter the governance of complexity. The ultimate temptation is that of wishing to explain our historical deeds, and above all wishing to govern them politically, with simplistic recipes, which may be convincing at times but fail to grasp the complexity of a situation. There is a tendency to invert the trends of the economy which continues to grow without any regulations vis a vis politics; that politics ought to regain the primacy within government of society, and so that this may happen democratically within a system which guarantees liberal principles, it is necessary to reinforce the great international institutions such as the UN, the EU; those institutions founded on democracy and liberty which may stop the almost savage development of global capitalism, without cutting out creativity and spontaneity. Indeed, it is easy to object to this position which remains interesting and important, that is to say, that the almost Kantian aspiration to a and enlightened global government; an abstract aspiration toward which one may move as an ideal model but which is unrealizable within a model that has been formulated on paper. Here it is worth noting that Wallestein has pointed out that, within a Marxian perspective, that Marx himself had predicted the globalization of economy way back in 1848. And it was Lenin who announced that imperialism was the supreme achievement of capitalism, and a Keynes, within Anglo-Saxon culture, have always insisted on the strict relationship between global markets and global politics. But looking at contemporary politics the question arises: is it true, after all, that there exists a globalization of the economy and the leveling of customs and cultures? Which is equivalent to asking: what exactly is the relevancy of globalization which is undeniable phenomenologically? Here it would suffice to remember the diversity of conception of the so called “free market” which exists between European systems, where the State’s intervention is very much present, and the North American system which goes through a phase of economic liberalism more advanced, not to speak of the Chinese system where there seems to be no regulations despite the presence of a hard political dictatorship. Here globalization presents itself with different characteristics. It seems a system of economic relationships, of trade relationships, governed by the principles of the market, of economic competition and international law. The life-style of an American youth appears quite similar today to that of a European or that of a South-American or a Japanese. So there are similar life-styles in all parts of the world, with the exclusion of those vast area which seem not have been effected by Western civilization where even the elementary conditions for social life seem to be absent. The spill over menacing at the border of the Western world. But even in such a case the leveling of life-styles provokes bitter and violent reactions, and even within the heart of the Western world, within globalization, one sees the proliferation of political groups, religious communities, social organizations, which try to reclaim their cultural identity, in contrast to the life styles which we have forged and have reduced to the lowest common denominator. To reiterate once more, the principle which governs the use of technologies, and in some respects must orient the research, needs to be an ethical vision of society. Ethics always implies responsibility, capacity to choose within the complexity of reality according to the only principle which in my opinion can be retained as an absolute, the principle of liberty. Only in such a sense can one speak of a religious sense of life. It has nothing to do with fundamentalist integrating doctrines, in as much as it already contains within itself, within its etico-religious spirit the dissolution of those fundamentalisms or catechisms. A principle this which cannot be motivated or explained with scientific reasoning, which cannot be proven by empirical experiments but which nevertheless lives spontaneously within our consciences, in some more so and in others less so: the principle of liberty. If we begin to think of the elite and artists and in terms of how they have survived. Their power struggle, their political status, their family structure, the dystopia of their reality, their heirs apparent, their internal struggle then I think we will find ourselves in the nexus between civilizations' demises and dehumanization. Why the elite? Why artists and particular the feminine voice, the female intellectual if you will you may ask? Perhaps the answer will surprise you. As a feminist, I think that the demise of any society does not begin and end with man but rather with the female of the species. We are still around, happily, unhappily, that counts for something. For a long time, I think people just thought that women wore the costumes of mother, daughter, that we were shadows, guests in a man’s world, dominated by a man’s brilliance, physicality, strength, intelligence and that we had to marry. We had to have children. We had to embrace the world our mother inherited. That never happened to me. Instead, I find truth, beauty and goodness in writing. I know what death is. The world smiles at me with awareness, with promise, with visions of glory and I am stupefied. I think the only enemy that I have is myself and of course, the violence that I am witness to and my own brute force that sometimes chills me to the bone. The things that I say without thinking. Souls are miracles. The thing is I know what humiliation is. Humiliation has started wars. Climate change has led to the end of ancient civilizations (and of course, it has led me to think that that is what will happen to this planet). Dehumanization is another kettle of fish. Every generation we think that the world will end. We think our misery will end. The war poets write sonnets about things like this. Every generation on the face of this earth has had war poets. Verse cures tragedy. It encloses our failings and tells us that we can wake up tomorrow. Believe in our children’s future. We think, we know, we pray, we believe that our childhood and that of our children will save us. In a way, it does. It fills in the blanks. Whispers to us in the cold numbness of autumn and winter. It is extraordinary how humanity survives. How we continue to survive through it all, illness especially. If I speak as a feminist, it is because I think that women, all women still do not have a voice. I am not a feminist because I believe in equality, that men want obedience from women, that women who do not go to university or have a degree are illiterate. I am not a feminist because I think that a woman wants a mansion. It is simply because I believe that not all women have a voice. That is dehumanization in a way too, I think, on the most basic level. Grassroots. Imagine that you have a branch in your hand. It is a frozen branch. Nothing can grow on it. In other words, that is the grassroots level. No imagination. No sunshine. No environment. Many people have to learn how to adjust themselves to society again. It takes skill. Manoeuvering. That is where our demise lies. Ancient women did not invent the wheel but they were there when wars ended. They know what sin is, casting spells for togetherness, the single woman flying solo in the bright lights of the city syndrome is. I think all women (when they reach a certain age) knows what darkness is. A woman who has progeny that she carried in her womb for nine months most of all. Perhaps they did not write with the effort and commitment in the way that men did, keep diaries in the famous way that Sylvia Plath and Virginia Woolf did. Perhaps they did not write poetry about the currency of the Milky Way, sun, moon, tides, and fabric of stars, time and planets or have a school of philosophy the way that the men in their lives did. Their canvas was their cooking pots, and childbirth. They advised their husbands. There was no need for them to portray themselves as politicians, writers, intellectuals, scholars. I think we will wage war until the end of time. Far be it from me to exclaim that it is in our genes. Programmed from birth to reach the wuthering heights of academic pursuits, or the flaming dementia wards in old age. Traipsing up and down the footpaths of the higher learning of education. The argument is ‘the Nexus between civilizations' demises and dehumanization’. Where is it? What is it? Where is it going to take us in the next decade, the next five years? The world as I know it is surreal. The artists are all Dadaist. Poets gone but not forgotten. We all seem tarnished if we look through the artist’s fully illuminated lens. The thing about people, violent people can be beasts but it is only their attitude, their personality that is violent, does it really have anything to do with their inherent character because characters can be competent and caring. Meanwhile, violence is incompetent. In the distance, the future imagined like clockwork. Chronic pain is always both an illusion and reiterated. Repetition is our law. The past is alien like our dreams, goals, fantasies and delusions. She has knots to loosen that unnerve her but she loosens them with skill. Violence is the unnerving enemy. The sad fact of the matter is that these days violence is a skill. a flash of the mental, physical, emotional, an invasive ghost story, wordless, bold, knifelike-edgy, and the shocking truth of it all, inescapable trauma. There are points of darkness, fury, blurred lines, and an unforgiving reality to violence, to dehumanization, to stripping humanity bare of distinguishing marks of valour, honesty, justice, and integrity. We can speak of betrayal in the same tones as violence. We have still succeeded at life, at living, at having this hip and happening, this divine lifestyle if you want to call it that. I do not envy the elite anymore but what I do see in the violence that I sense and see all around me is a type of spiritual poverty. I see people intoxicated by courage or the fear in others. To me, fear can be an internal struggle against the wasteland of modern society. I see the elite passing on this intoxication, this infatuation with power leaving puppets, mannequins in their wake. Poetry always smelled like spring dirt to me. I write poetry because it stretches my imagination everywhere. It is both an illusion and a gift to me. It gives me vertigo, insomnia, melancholia, burnt out stress. I am the shaking woman. It is my choice to be insignificant. I do not travel to faraway places. I do not save for a rainy day. In childhood, we taste innocence many times. I think if you are a true artist, you will always be under its spell. I believe that the world would change if we were all equal but would it change us all into robots, would we live in paradise. I am a late bloomer or usually if I bloom, it is after midnight. In the cool early hours of the morning. She was posh. She was bold, brave and brilliant and I was not. She was Sylvia Plath and I was Anne Sexton. She was the sunlight in my Hades. The elite. Well, they lived. She fed the thoughts that were my lake. On good days, the surface of that lake was flat. I listened to classical music a lot after I left the hospital. Sometimes the history of the melancholia would go by daily unnoticed. One night it was my father. The next night it would be me. The mental illness, the bipolar would revert to cyclical motions in our family. Mania, the onset of it was like fire, threads of light, fireworks, sparks floating in the air. That was still when I was at home. When I was at the hospital, it was a different story. They tell me (my parents, my father especially) that there is justice in loving someone else but I just do not see it. I see the betrayal and the promises. I could have said several things to her. Things that mattered. I saw her illness. She saw mine. I write to replenish myself I told her. I pray she told me. When a friend arrives, we holler hellos as if we had not seen each other for years. We know it when we see it. Us writers. A likeminded soul. Instinct, I guess. I think that in the end that is what saved the world from the first two World Wars and The Great Depression. We could all relate to what was in the air, the change in the atmosphere. We have a responsibility to this civilisation and if you do not have that then at least have hope. As if, there must be a reconciliation again. There were cracks that the illness shone through long ago. The female reflection in the mirror projected its lovely ego onto me. Wear dresses the reflection told me. It will make you brave as if you are going out to war with another country or city where wolves, tigers and lions are forbidden. Where you can eat a childhood breakfast that they served you up in the hotels you stayed in with your family as a child when you went on holiday. There are rooms that feel as cold as winter. Rooms that feel as warm as summer. All you have to do is wish it into reality. Rooms where you bloom into culture and imagination. The roses of the awareness of creativity and the visions that comes with it. Suddenly I understood my childhood environment. I extrapolate the intellectual from everything in my life. There is a startling metaphor in the map of stars and the fabric of the universe. The sacred contract that we have signed with the mountains, the hills and all of that jazz bleeds into the wasteland. You are necessary to me I told her. I need you as I need air. You are a myth. Flame. Beloved. Afterward you will become a protagonist in one of my books. We shared each other’s sorrows. In the end, her suffering became my suffering. My sadness became hers. Let it fall. Let it fall. Let it fall where leaves and that grassiness find themselves. My intellect is coloured with attachment. Nothing has changed there. I talk to her now in retrospect. I make believe conversations that we had. She arrived in my world like spring. Her courage impressed me. My throat spoke of darkness. A voyage into my twenties. Love came on a Thursday. I loved the way she wore her hair. The way she walked. The way she talked and articulated herself. In the end when two women love each other, there will always be a death or a succession of deaths. In the end, in my eyes there was a darkness. In order to love, you must forget, forgive and remember. You must remind yourself repeatedly that this is not a game but in the end, there will be a loser. Perhaps it will be you. You must prepare yourself for that. Love was like a flood. A tsunami. The villagers crowded around us in the canteen as we lined up to receive a hot breakfast, a filling lunch (usually grilled chicken), an early supper at five o’clock in the late afternoon. We would look for each other but we would not sit with each other. She sat with the ‘dysfunctional crowd’. The children of the elite. Teenagers who suffered from anxiety, panic attacks, body dysmorphic, social and eating disorders. Stupidity inhabits both human life, wilderness and wasteland. I sat alone. I was always alone. I preferred the road of loneliness even then in my early twenties. Wolfing down my food as if my life depended on it. Pretending that nobody could see me. You have to be careful on your life journey. The partners that you pick to accompany you across bridges. She silenced my childhood trauma. She was the river dust to my river Ouse. She might as well be dead now. The elite will give you hope. Teach you everything you need to know about positivity and human potential. Accepted by the elite (they all had wings) I lived. Walls have emotions too if you listen carefully. Their voices are made of stone. He is not there anymore. I look and look and look for him but to no avail. He cannot be found. God does not want to be. I have to ask my heart does this make her happy or sad that she, my heart is finally released from the past. Relic. Witness. I am restored to a healthy specimen. Touch as poetry is always filled with consent and profound courage. It leaned into me like a lover. I do not exist for this love anymore. All I can remember was coming in from the cold. Coming home. Coming home. It always starts this way but near the end of friendship you realise you must survive. Once upon a time in my life, in my twenties, women seemed to be made of echoes. All that harmonic summer the interiors were cool in the beach house my sister rented. We were made of iron. Made to rust. Made for verdigris. The men and women around us at the beach seemed to turn into echoes of entertainment. Their roots in harmony. Haunting and pleasant at the same time like a picnic lunch. I could have danced but I did not. Instead, I drank my pharmaceuticals. I know there is a network of veins. When, how and where. Everything feels like a wound. The noise, the garden sprinkler, birdsong, music, the radio. It is all like fire to me. The general population, the psychiatrist, the psychologist is of no help to me. They all want to teach me ‘the joy choice’. Why be happy when you can be mad as hell. The sun and sky in your reality shielding you from the real mad haters. The real haters. This is my soliloquy. I am Antigone. I am Joan of Arc. I hear voices in the dark. I sometimes see things. Mediums call these visions. Abigail, the above is indeed a sterling example of confessional therapeutic feminine writing as displayed in your individual postings at Ovi and the bi-weekly symposium meetings. As I have endeavored to point out, however, there is another alternative view-point on the genre, used by by both men and women writers, which may well be worth exploring and perhaps discussing at some length. I attach below abrief example of such an alternative view as proposed by Irina Horodinca, Co-Founder at "Livinteresting," an on-line forum on philosophical dialogue and exchanges. She quotes an excerpt from Annie Kagan’s book The Afterlife of Billy Fingers: How my Bad-boy Brother Proved to me there’s Life after Death, which paradoxically could be easily construed, by its very title, as confessional diary writing. Horodinca utilizes the excerpt to initiate a philosophical-literary discussion on the issue in the online forum “Global Philosophy Group.” It appeared on July 30, 2015 and frankly I remain a bit perplexed by it all. Perhaps you can offer some elucidations on the matter. You might think that what I am about to say is strange Emanuel. In some way, this journey, childhood, adolescence/youth, my twenties, meeting up with humanity, scholars of trivia, experience, years filled with irrational doubt, sensitivity to the world around me, everything from the environment to my parents, fear, and all of that, school, ridicule has led me to the impossible. What I thought for a long time was 'the impossible'. That I would write. That that would be my calling. I have embraced it, this journey, the destinations it has taken me to, the extraordinary pilgrimage, this strange encounter with projecting my reflection or a persona, like a beautiful stranger wearing an elaborate costume to a party. For a long time I thought to myself what is this world coming to. I want to have a voice but I also want to make a difference, communicate the issue of climate change in the same breath as I write about battling chronic illness. I am a writer and in the same vein, a poet, an artist but I think that every human life on this earth in their own 'genius' way is a writer, a painter, a poet, and an artist. In my writing I have discovered both myself and the face of love. I was always 'coming to terms' with something or other as a child and a young adult, 'losing my religion' (perhaps that is why I turned to spirituality and writing. I am emotional when I write and even when I write I think that I am still suffering in silence. I am more a do-er, a thinker, yes, now a writer too. I never, ever thought of myself as a feminist because my mother was not raised that way. I came across feminism in literature. The books I read and when it comes to accepting the fact that I am a confessional writer (I have to admit that I like the sound of that. Confessional therapeutic feminine writing). I like the thought of calling myself a writer but also think to myself about where do I fit into the literary establishment. I think of my mother, often, long and hard and then I think about myself. About how different we are. I have always kept diaries ever since I started writing and that was when I was a child. Reading what you wrote Emanuel brought back emotional memories. Confessional sounds as if I have something to say. Found my place in the world. Thank you Abigail for the above elucidation of the poetics of confessional feminist therapeutic stream of consciousness. However, the question I asked was on an excerpt by Anne Kagan which seems to propose another alternate point of view on how to get to the identification of one’s own unique self. Is it a purely subjective interior process or journey, a sort of interior monologue characterized by the literary mode of the “stream of consciousness,” or is it an exploration into the by-ways of the human mind on the objective nature of the world of the intelligible? Is such an exploration be better feasible within a dialogic or essay philosophical-literary mode, rather than a purely subjective confessional form? Does confessional writing include, for example, the xenophobia going on in South Africa, as we speak, toward migrants from other parts of Africa? Or does the exploration remain stuck into subjective personal problems? Those questions, alas, remains unanswered. It is to be hoped that we may perhaps be more adequately address them in future dialogues in the Ovi symposium. Freedom is a condition that is of the utmost importance as a catalyst in giving flight to the growth and nurture of our humanity, like fertile dark soil that nourishes green shoots to enable them to grow into strong saplings and then into arching majestic green lush leaves basking luxuriantly under the corbelled heavens and the dazzling sun melting like an egg-yolk in the blue sky. The condition of freedom then is fundamentally necessary for the nurturing of both the individual life and the life of humanity itself. When one discusses the concept of freedom these days, it is in the context of political freedom, of how our various human civilisations and societies arrange and organise themselves politically; but the freedom that is discussed here is of a more universal and fundamental nature. A freedom that has existed before the birth of the world from the moment the first gasses coalesced together. From the early days of our young planet when the birds and beasts roamed freely where they liked among the grassy plains and the savannahs. Through island chains and archipelagos, bristling forests and the ocean deep and imperious snow-capped mountain peaks; and it is in this world that humanity was nurtured, to grow and develop into the sophisticated societies of today, and yet somehow in achieving a societal progress we have lost that freedom and now live in 'bird-cages' of our own making. The American astronomer Carl Sagan once said; "The nitrogen in our DNA, the calcium in our teeth, the iron in our blood, the carbon in our apple pies were made in the interiors of collapsing stars. We are made of Star Stuff." Where this realisation is of a profound importance, that we share a communion with the celestial heavens, that our very molecules comes from the stars and that our innocent awe and longing when looking up at a nighttimes sky lends a more profound meaning. Then with life being so precious and imbued with a certain cosmic sanctity, how then do we petty creatures in our own century, our own day and age devalue life so when we reduce the value of life of our fellow human beings by the cruel application of dehumanisation, demonization and racism?" We are a young species, and have so far to go yet in this vast and wondrous cosmos, but we feign pride in the twentieth century at what we consider in our own consideration is progress. Yet this is no progress at all in the vast scheme of things, for the important ingredients and components that will enable us to propel ourselves forwards into this cosmos lies in our humility, our dignity, our imagination, speculation, and our solidarity all combined through a mutual respect and an existential freedom. Yet the twentieth century has brought about with it some of the most violent and heinous examples of the failure of our own humanity. The dehumanisation and demonising of individuals, groups of people and entire nations which has occurred - to our embarrassment and shame - right throughout the twentieth century and right up to our own day and age; and this therefore requires a careful examination of these negative concepts to enable an understanding of why these events have occurred that lead us off track from our cosmic journey. Dehumanisation is the denial of the humanness of others; the denial of the individuality, the intimate and creative aspects of a person or group. It thereby prevents a show of compassion towards the individual or group. This can occur via idiomatic language that compares human beings to animals, through symbolism and imagery and also through the physical by slavery and physical abuse. Dehumanisation can be carried out by social institutions such as family, school and social groups; and also by the state against political, racial, ethnic, national or religious minorities; and can also apply to marginalised individuals and groups based on class, gender and sexual orientation. It is therefore an insidious and noxious evil that finds itself present in social connections and power status which results in behaviours such as violence, the promotion of violence and exclusion; and this leads back to a focus on humanness and what humanness is, which is the target of dehumanisation. There are two components to humanness: identity and community; where the identity as an individual composes one part of our humanness. The perception of a person as an individual, independent and distinguishable with the free will to make choices. The other part of our humanness is based on community; which is the perception of the person as part of a community and it is when the victim's identity and community are denied that there is no longer any moral barrier or compassion which inevitably results in atrocities and violence. A further examination of dehumanisation reveals that it comprises of two components; of animalistic dehumanisation and mechanistic dehumanisation. Animalistic dehumanisation is based on an intergroup basis where this occurs when our human characteristics are denied to an out-group; and where in turn, the victims are seen as unintelligent, lacking self control, amoral and are likened to animals. As occurred to the Jews during the holocaust, the Tutsi ethic group in the Rwandan genocide and the African-Americans in the U.S. Mechanistic dehumanisation occurs on an interpersonal basis where a person's warmth, agency, emotionality, high order cognition, civility, morality and language are denied to the target group. The dehumanisation based on ethnicity and race which are the most obvious examples, where racial groups are compared to animals to reduce or negate their humanity in the eyes of the perpetrator group to thereby make their dehumanisation actions morally acceptable. Where African-Americans where compared to apes for example during the nineteenth and twentieth centuries in the U.S, or when Jews and immigrants were compared to vermin and rodents. It is racial dehumanisation such as this that has lead to the genocides of the twentieth century. Yet here governments have also played their part in dehumanisation, where the process of dehumanisation has been central to governments in convincing their populations that the enemy soldiers represent something less than human to thereby justify war. This has also similarly been used by dictators, regimes and nations to represent governments and people as childlike and incapable of managing their affairs thereby justifying the colonisation of these target groups or people. Therefore it is when people become defined as 'things' that they become dispensable and atrocities are therefore justified in the eyes of the perpetrator population as in Nazi Germany. Here, the even greater shame is that one the pinnacles of human achievements - science - was recruited to undertake horrible and inhuman experiments as for example, what the German scientists did to the Jews, or US doctors did to the African-Americans during the twentieth century Tuskegee syphilis experiments. In our modern day and age, a more subtle dehumanisation is used; in political debates for example where political candidates and their supporters and considered as stupid and evil, or when corporate media also participates in dehumanisation when they promote profit-making at the expense of the humanity of large sections of the population. Then we find ourselves holding the magnifying glass to our various civilisations around the world and find that capitalism, the media, education, society, religion, materialism, consumerism have all failed and have become conduits for a soft and insidious dehumanisation which has the danger of growing into a conflagration, if people and societies do not become aware of their own contributory actions. It is only by carefully examining the events of the past where we can hopefully learn and correct any current dehumanising behaviour. The French philosopher Voltaire once said; "What is tolerance? It is the consequence of humanity. We are all formed of frailty and error; let us pardon reciprocally each other's folly - that is the first law of nature." At present, for the continued flowering of humanity, dehumanisation can only be destroyed if our humanity and humanness is respected and held sacred, when differences are celebrated and respected, and freedom becomes the catalyst for the gelling of all that is good in ourselves. Only by an honest reflection and examination of our dark shadow can humanity hope to prosper, and now is the time for such a reflection. One would have thought that with the advent of the twentieth century, that the cruelty and barbarity of previous eras would have been consigned to the dustbin of history along with dehumanisation. That with the advancement of technology and science post industrial revolution, our dark shadow and primitiveness would have simply dissolved. Yet as it is, science has not absolved us of any of our bad habits and sins, has not made man any more morally and ethically upright; for that can only be done by man's own humanity, by man's own humanness. It is this idea that we have to attempt to answer as we travel along the timeline of the twentieth century in examining an era that has brought with it more dehumanisation than at any other time in human history. Where there might have been an excuse due to the 'innocence' of man in previous eras, with the technological and societal sophistication that has been achieved in the twentieth century, man has no excuse at all. The beginning of the twentieth century was a bookend for the old imperialism of the European powers of the nineteenth century that stretched back to the Renaissance. German, English, Austrian, French and Russian imperialism played out and came to an end in one final imperialistic explosion: World War One. It brought death and chaos to millions and with Germany as its instigator and the loser of the war as well. The treaty of Versailles brought about a swift and heavy punishment to Germany which then precipitated its economic and societal failure that in turn collided with the world economic crisis of the late 1920's. German society at this time was in a volcanic turmoil due to its inability to undertake an honest self-examination and accept the moral and ethical blame for its own actions. Instead Germany turned to the dark shadow of its humanity through the guise of the fascist ideology of Nazism. It was under the spell of the Nazis that Germany decided to deny its own guilt and instead project its guilt onto the Jews within its own population. They decided that Jews should be held accountable for the downfall of Germany and that they should be accordingly be punished. Yet to enable this to be palatable and inspirational, the creation of national myths for the new German nation was necessary; they turned to the nineteenth German philosopher Nietzsche who advocated in 'Thus Spake Zarathustra' that God is dead. Traditional moral and religious principles were rejected and this therefore necessitates the emergence of the the Übermensch, the Superman (Oberman) who is the antidote and who will replace God, where Nietzsche stated; "I teach you the overman. Man is something that shall be overcome. What have you done to overcome him?" Nietzsche also stated that; "...I call Christianity the one great curse, the one enormous and innermost perversion...", and it is these philosophies of Nietzsche that were perversely interpreted and used by the Nazis for their own ends in the creation of propaganda that they considered myths. It is the philosophy of Nietzsche which in turn influenced the ideas of the twentieth century German philosopher Martin Heidegger who became a member and supporter of the Nazi party. The publication recently of Heidegger's philosophical diaries termed the 'Black Notebooks' reveal that antisemitism was at the core of his philosophy. Heidegger writes in the notebooks; "World Judaism, is ungraspable everywhere and doesn't need to get involved in military action while continuing to unfurl its influence, whereas we are left to sacrifice the best blood of the best of our people". In the 1930's, Joseph Goebbels was made the Reich’s minister of propaganda in Nazi Germany in the environment of a Great Depression which increased unemployment, nationalism, anti-capitalism, and anti-Westernism. At this time Goebbels campaigned to blame the woes of Germany on the Weimar Republic, the treaty of Versailles, and the Jews, advocating the creation of a new German society based on race and national unity. It is during this time that Goebbels attempted to buttress the myth of the German Superman by seeking in the pages of history evidence which would support the racial superiority of the German people. He did so by trying to obtain an ancient copy of a book written by the ancient Roman Publius Cornelius Tacitus called 'De Origine et situ Germanorum' (On the Origin and Situation of the German people); or more colloquially know as 'Germania'. In Germania, Tacitus's observes the various Germanic tribes, describes their physical and social characteristics. Later Germans, during the periods of romanticism and nationalism post the seventeenth century Pan-Germanism and Nordicism, took these descriptions of the ancient Germans as an idealised vision of their own national identity and image. Yet Germania also described the negative characteristics of the ancient German tribes; he noted their characteristics of habitual drunkenness, laziness, and barbarism, but Goebbels only chose to use the positive characteristics to craft an illusionary new national German consciousness. It was this that led to their sense of a racial superiority over the Jews and other peoples. When this Nazi ideology was crafted and promoted in German society, it paved the foundation to enable them to achieve their aims at liquidating the Jewish population from within German society; but this could not be completed without the application of the dehumanisation of the Jews which would enable the ordinary German to accept the murder and genocide of the Jews without guilt. This was achieved firstly by the use of animalistic dehumanisation; where the human characteristics of the Jewish people as a whole where denied them; where they were seen as amoral and lacking self-control and compared to animals like rats and vermin. When people become things or objects, they then become dispensable and atrocities therefore become justified as it happened in Germany on a wide scale where even bright men like the philosopher Heidegger succumbed to this dark shadow and embraced anti-Semitism, let alone the common German man. Then once animalistic dehumanisation was successfully promoted by Hitler and Goebbels, mechanistic dehumanisation was then applied on a personal basis where a Jewish person's characteristics that define their very humanness; such as cognition, civility, morality, warmth and emotionality where denied them by their fellow Germans. Subsequently, discriminatory measures where instituted in Berlin that included bans against Jews using public transport and requiring that Jewish shops be marked. Synagogues were damaged and destroyed, and thousands of Jewish shops were vandalised in what has since been called Kristallnacht (Night Of Broken Glass). Jews were forced to wear a yellow star to separately identify them from their fellow Germans thereby completing the animalistic and mechanistic dehumanisation. What happened next was the greatest stain on any modern European nation, where a campaign of the physical extermination of the Jewish people was undertaken in the various death camps in occupied Poland where Goebbels stated the following on 27 March 1942; "In general, it can probably be established that 60 percent of them will have to be liquidated, while only 40 percent can be put to work. ... A judgment is being carried out on the Jews which is barbaric but thoroughly deserved." Even in the death camps dehumanisation was taken to an even more extreme level, with men and women forced to strip, their hair shorn and possessions confiscated; without any respect and dignity afforded to them to all finally end their days in the gas chambers, ovens and ditches. Their gold teeth were pulled out and their skin sometimes used to make lamp shades. The dehumanisation of the Jews enabled the Germans to kill them without any psychological guilt. Dehumanisation however does not stop with the Germans; animalistic dehumanisation was used against African-Americans in the U.S. where blacks would be lynched when the mood struck; or the dehumanisation of groups of people and individuals during the Cold War by the Soviets and the Americans during McCarthyism; the dehumanisation of religious, ethnic and other minorities defined by gender and sexuality in the Islamic world; the genocide perpetrated in Rwanda in recent times and off course the dehumanisation that is occurring right now in our own modern day. Even after all that has been learned about dehumanisation, demonising and stereotyping; the latest dehumanisation is occurring in the media, in various social media and in cafes and pubs where the Greeks during the recent financial crisis are the latest victims of dehumanisation. Most people who participate in this dehumanisation do not think that they are participating in dehumanisation when they classify the Greeks in sweeping generalisations such as being lazy, corrupt, untrustworthy and deserving their punishment and fiscal water-boarding. Yet this echoes the same generalisations that were used by the Germans against the Jews during the holocaust. In conclusion, the road to dehumanisation is insidious because demonising leads to racism, which leads to dehumanisation; and once this occurs - as is happening at the moment - is just one step away from violence to show its ugly face. People then become objects, denied of their humanness. The question then has to be asked, what is an antidote to this? The most important factor is to rediscover both our humanness and each other's humanness, and this can be accomplished by the immersion in and promotion of the humanities. Indeed science is extremely important, for it gives us the tools to discover and measure the physicality and mechanics of the cosmos and how it works and functions. It however cannot give us the answers on the meaning of it all, the meaning of our place in it, and the profound significance of the Star Stuff that we carry within us that links us to these myriad blinking stars that are fixed in the dark vault of heaven twinkling brightly like a flashing peacock's tail. Humanity needs both scepticism and imagination, fact and speculation; but it is only when we first respect our humanness and the freedom that resides within us as children of the stars that we can truly flourish; for in the end , we are more free then we think. That great American Astronomer Carl Sagan stated the following in 'Cosmos, Part 11: The Persistence of Memory (1980)': "What an astonishing thing a book is. It's a flat object made from a tree with flexible parts on which are imprinted lots of funny dark squiggles. But one glance at it and you're inside the mind of another person, maybe somebody dead for thousands of years. Across the millennia, an author is speaking clearly and silently inside your head, directly to you. Writing is perhaps the greatest of human inventions, binding together people who never knew each other, citizens of distant epochs. Books break the shackles of time. A book is proof that humans are capable of working magic." Books and knowledge are indeed the highest gift of our humanness, books and knowledge linking one generation to another through the universal and holistic shared experience that seeks to explain the bigger picture; and not through the relativist, particularist, infantile, narcissistic ranting of blogs, social media and confessional writers. For we have that greatness within us, that Star Stuff is within us, and it is only by looking upwards to the stars and viewing the totality of the heavens and of our existence within it can we find ourselves, and our humanity, and combat the evil that is dehumanisation. Life is filled with limitless elegant possibilities born from optimism, courage and joy that wells up from within, to spark that which was hitherto impossible and thus lift up the human spirit to lofty heights. When our courage is weighed down by doubts, self-loathing and hatred, the possible becomes the impossible and our very humanity is injured. Thank you Nikos for this comprehensive excursus in the nexus between dehumanization and myth-making within modernity. I suppose if we have learned nothing else from Carl Jung it is the notion that we ignore myth and symbols at our own peril. Myth is a double edged sword. It can be good and even necessary when in complement with reason. One thinks of Plato’s myth of the cave. However, when it decoupled from reason and the poetic, it becomes destructive of individuals and entire civilizations. Your essay gives us some great insights on this notion and opens a path to some further dialoguing and discussion on this interesting theme. There is no better place to conduct such a dialogue than in a symposium. Thank you for giving us this opportunity.